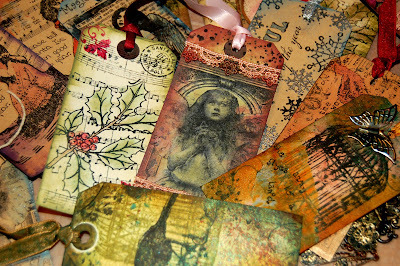 Prizes up for grabs Over at Alter it monthly. 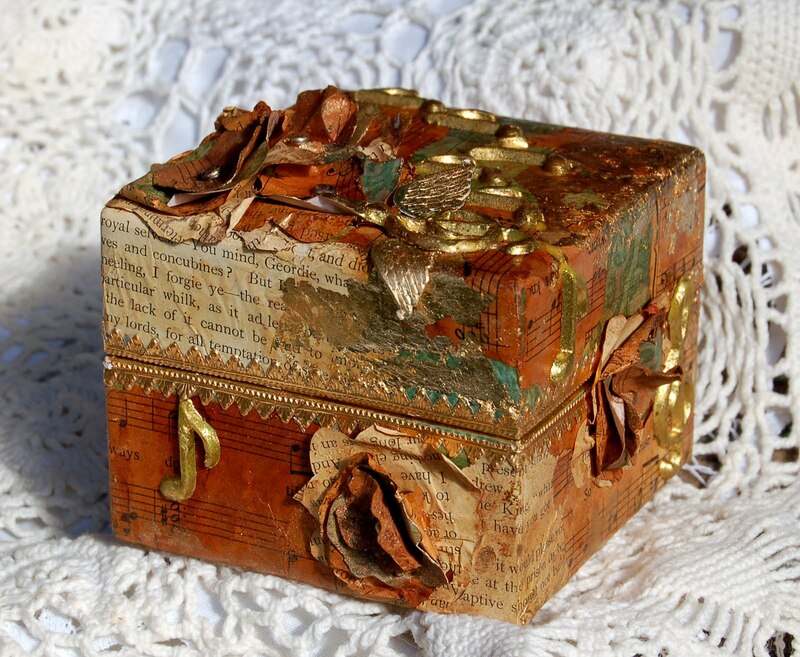 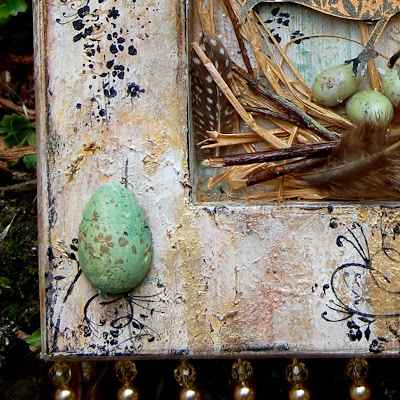 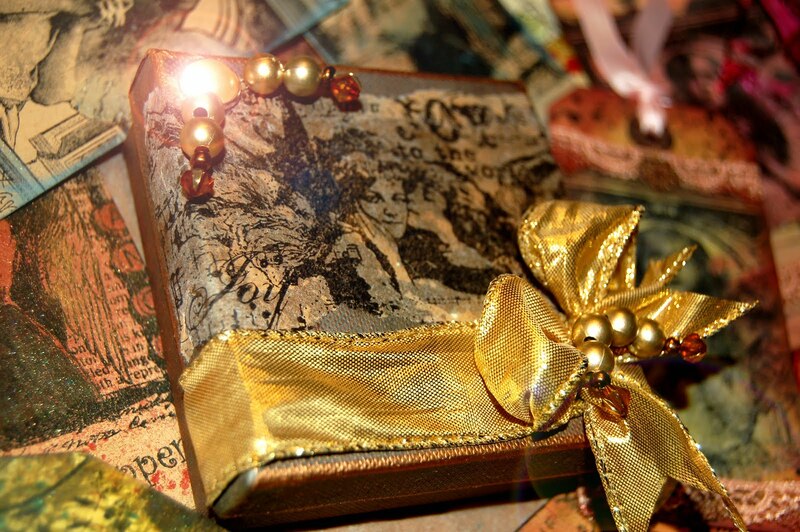 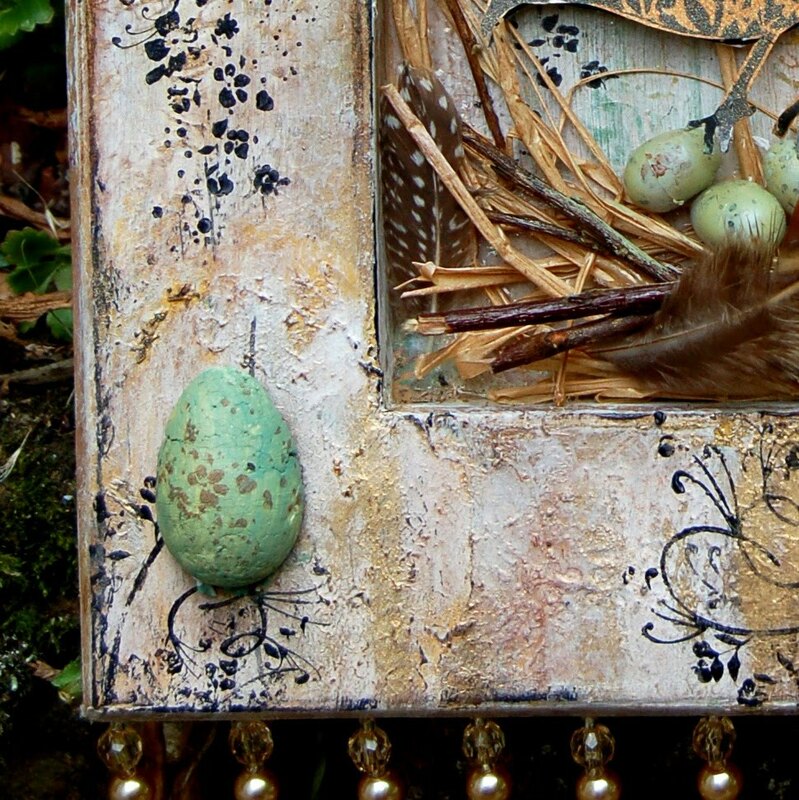 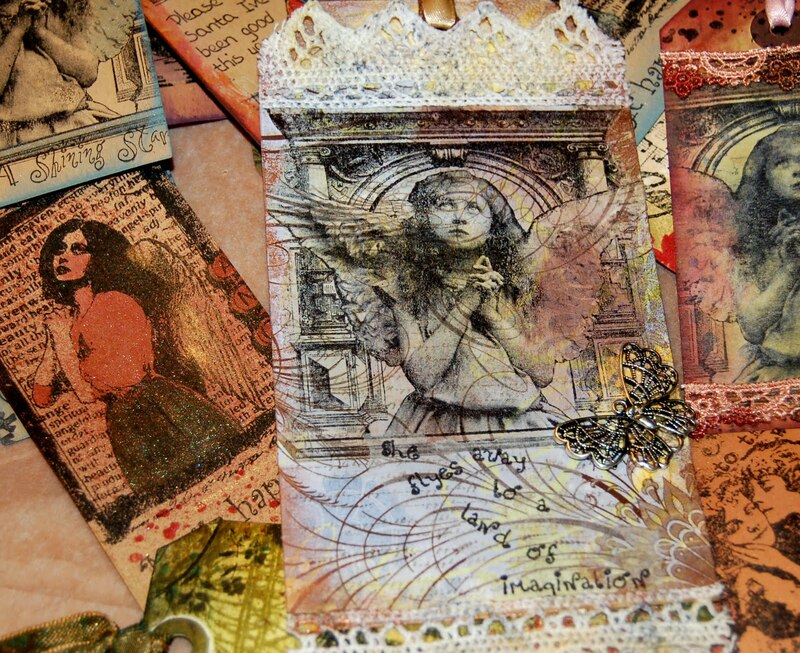 Don't forget folks, anyone in to altered art can make an item and win a cool prize over at the alter it monthly challenge blog run by myself, Carol and Gillian. 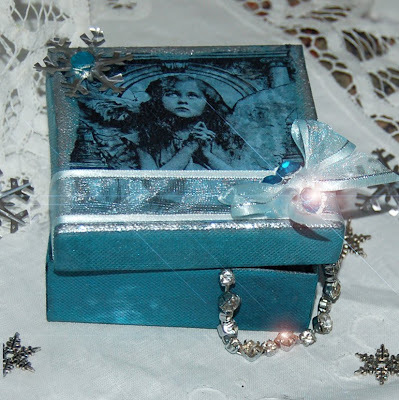 This month and for at least the next 5 months after that we have prizes from craft shops offering a prize voucher to cool blog candy put together with the altered artist in mind. There are still 10 days to get something in for this months music related theme and win a voucher for the Altered Element online craft store for altered art supplies. 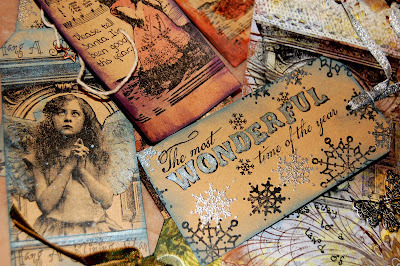 And if you don't have time this month then next month has a voucher for the Vintage Supplies Company (the theme for September is Rust). Wishing bottle.. And Mixed media Monday. 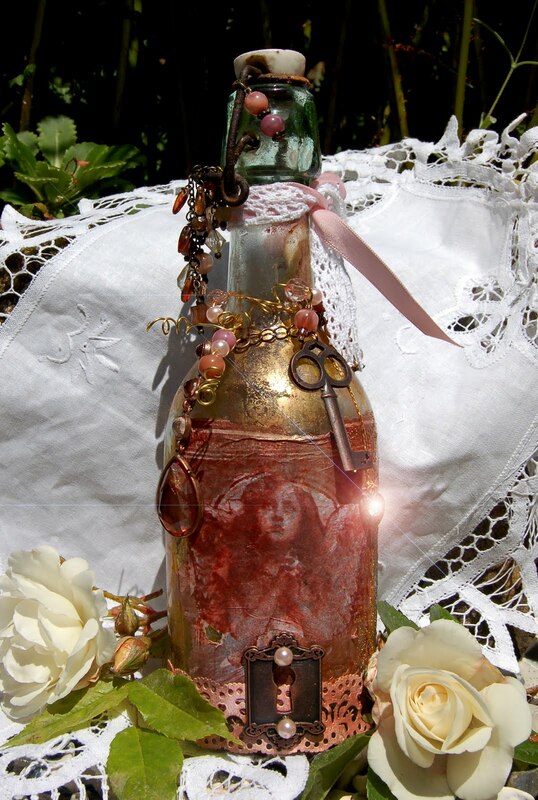 This is a rare bottle and similar to the message in a bottle philosophy. 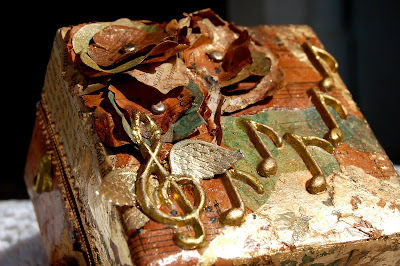 Simply write down your wish on parchment or the more modern "paper", roll it up and pop it in to the bottle... its advised to add a little something for the little people who will retrieve the bottle and decide if they should grant your wish. I have heard they are partial to humbugs. leave it near an open window or on the doorstep over night. All there is to do now is wait. 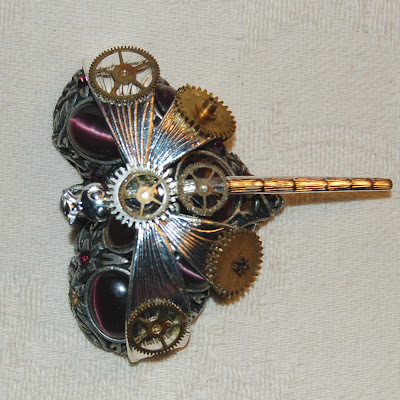 This is a Kilt Pin made for a forum swap recently. If you want the details on how it was made and what you will need then have a look on the "Happy Daze" online class HERE. Top one is a pendant I found among my mums costume jewellery. 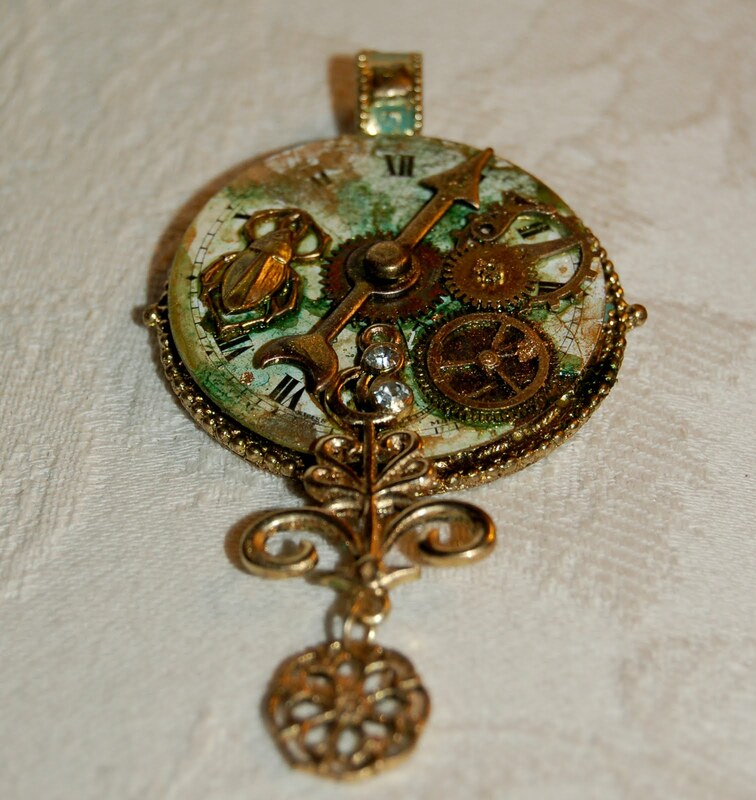 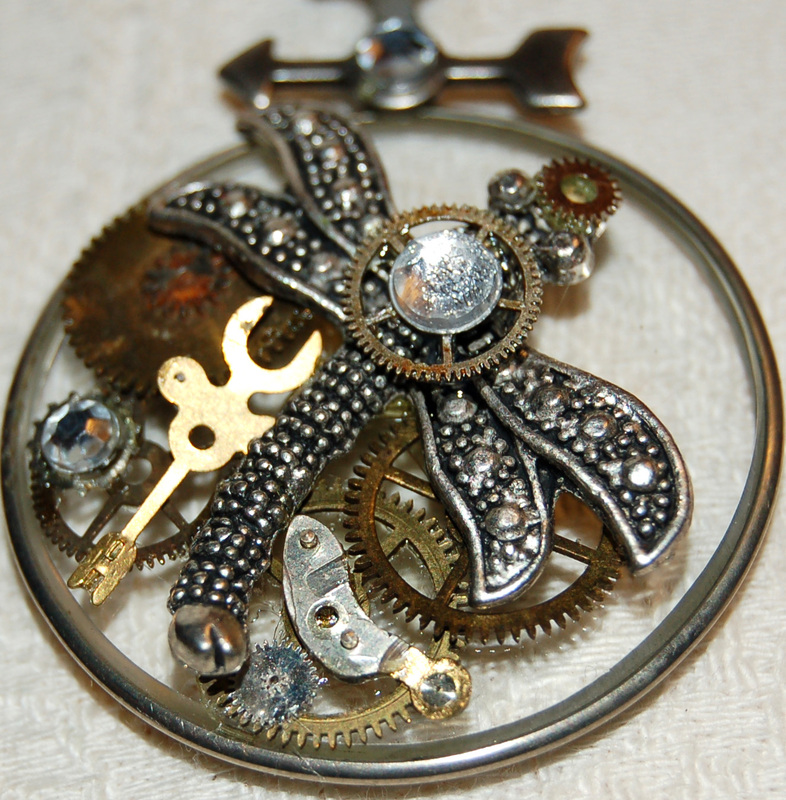 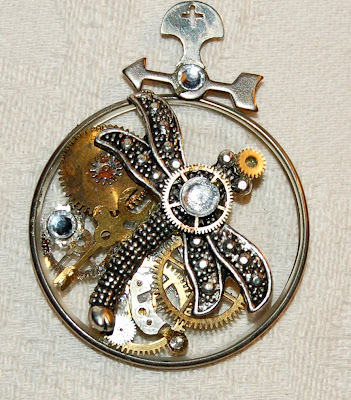 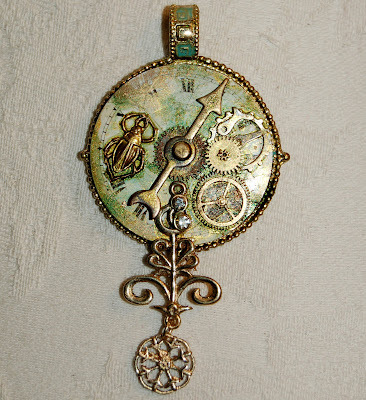 I added a clock face from a vintage pocketwatch, some cogs and a scarab beetle. Second is another optical lens, this time i attached the items to the front. 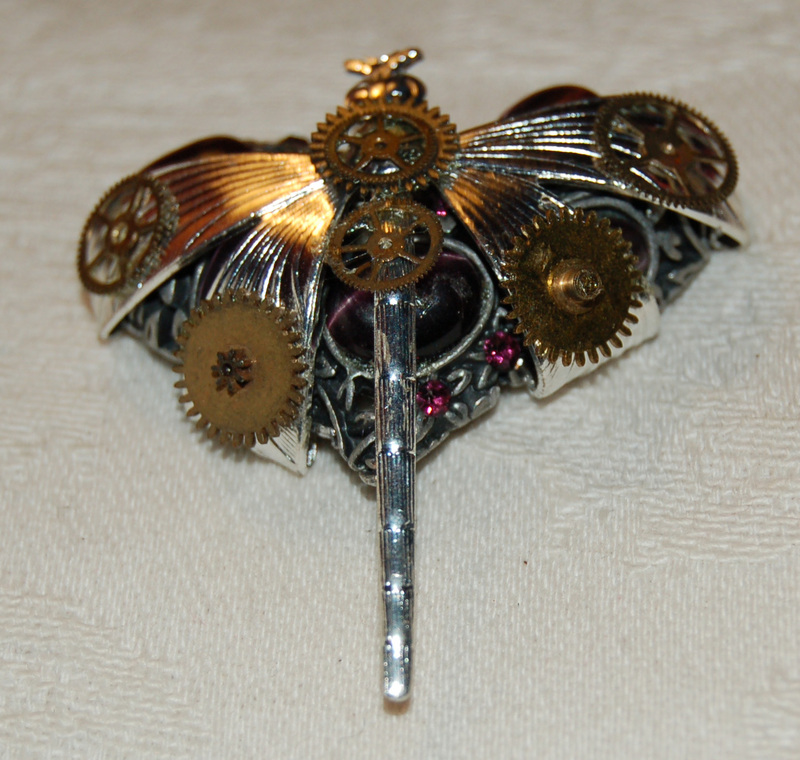 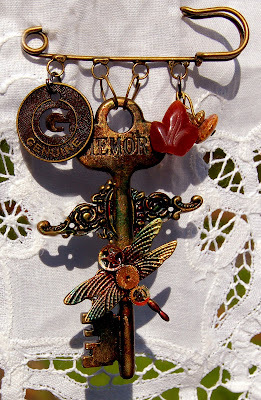 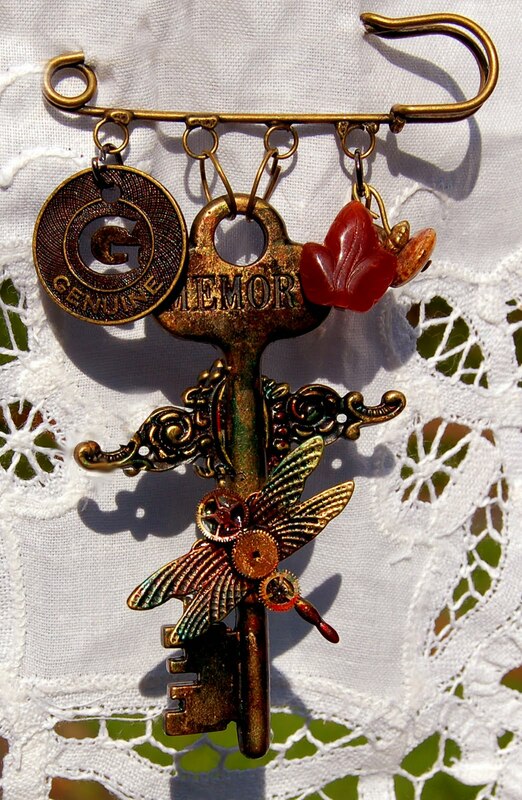 Third is burgundy stone encrusted Metal heart wrapped in a Dragonfly who I gave a steampunk makeover to..
August: Alter it Monthly and the Altered Element. 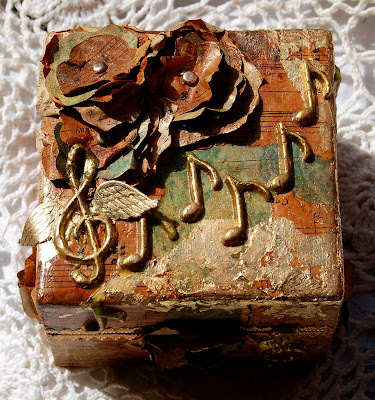 Alter it Monthly, have teamed up with The Altered Element To bring you the theme , "Music and rhythm find their way into the secret places of the soul” (Plato). By taking part this month, you can have your name entered in to the random Draw for a £20 gift voucher to be spent in The Altered Element online shop. 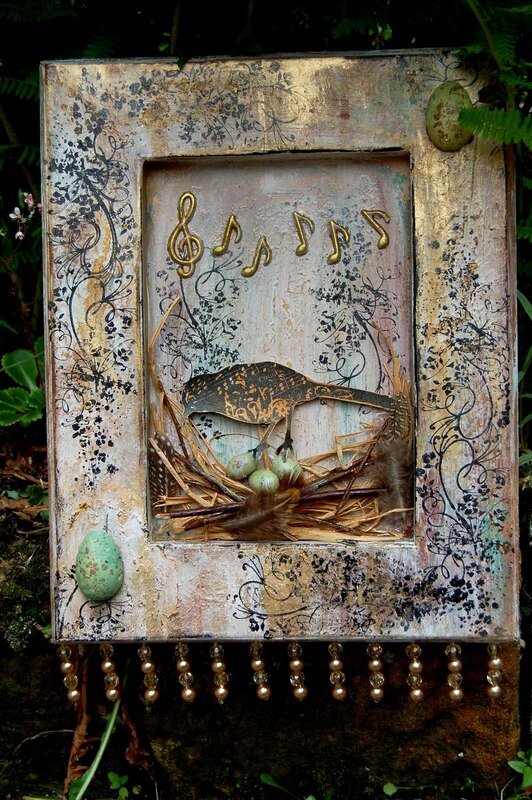 I have made two items for the design teams examples, both have been embellished with musical notes that can be purchased here From The Altered element.